Midlands Asbestos Solutions Ltd have completed a large Asbestos Removal projects for a local hospital in the East Midlands. 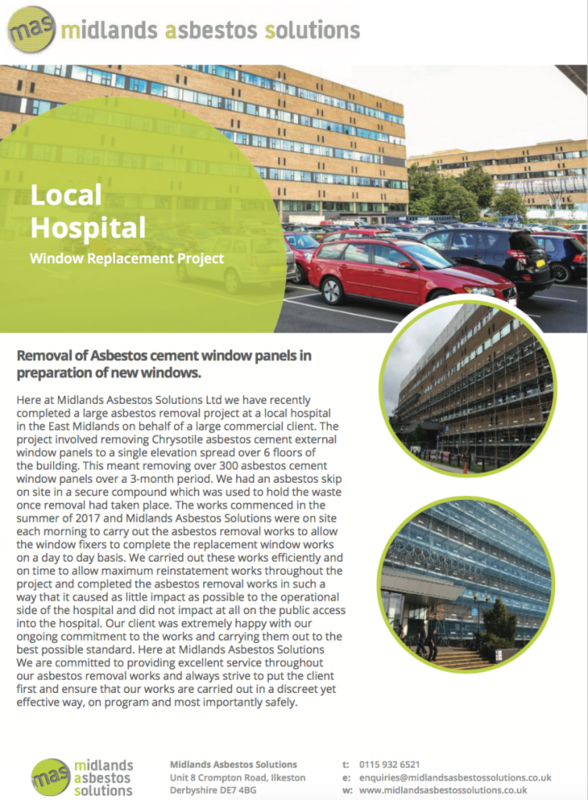 The project involved removing Chrysotile Asbestos Cement from external window panels to a single elevation across 6 floors of the hospital building. This meant removing over 300 Asbestos Cement window panels over a 3-month period. Asbestos skips were present on site, kept in a secure compound, which was used to hold the Asbestos waste once removal had taken place. Work commenced in summer 2017 with Midlands Asbestos Solutions being present on site each morning to carry out the required Asbestos Removal works. This allowed the window fixers to carry out and complete their work, replacing windows across the building on a daily basis. Working efficiently and within the time constraints set by the hospital, Asbestos Reinstatement work was carried out in such a way, that caused little impact on the operation of the hospital and did not inhibit access to the building for the public. Upon completion of the Asbestos Removal work, the hospital and representatives were extremely happy with the outcome of the project and our ongoing commitment to future work. Midlands Asbestos Solutions are committed to providing excellent service throughout our Asbestos Removal work from start to finish, ensuring our work is carried out in a discreet yet effective way to minimise disruption to the businesses we work with.